As Mars leaves a fun, playful, romantic and creatively charged part of your chart this not only brings his own 6 week visit to an end, but all the planetary activity for the year and joining work forces just as lucky Jupiter is spending his last weekend in your work sector, this will see your work hat sitting even more firmly on your head. Over the last 6 weeks Mars has been a staunch advocate for a need for a balance between work and play and while your relationships start needing more attention from today, this is one job that you'll need to take over as he moves on. 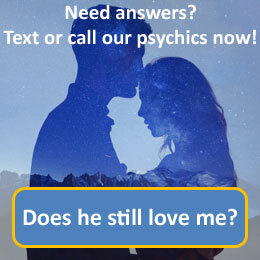 Call 09069 669 612 for a more detailed reading with our psychics today. Pisces, the fish, is the twelfth astrological sign in the Zodiac, which originates from the Pisces constellation. Pisces is considered a water sign, and is one of four mutable signs. Like the rest of the watery signs, Pisces is considered a "negative", feminine sign, which in Astrology means it is rather introvert. Being the twelfth sign, Pisces has been traditionally ruled by the planet Jupiter, but since its discovery, Neptune has been considered a modern ruler of this sign. Their lips will tend to be full with a pursed or puckering quality, the jaw is generally weak or subdued, and in some people, there will be a tendency to double chin. The nose is generally small, the facial features will be rounded, especially the cheeks, which may be prominent in some way, reminding you of the gills of their zodiacal mascot. Pisces are considerate to have the most beautiful eyes out of all the signs of the Zodiac. Pisces have the traits of being compassionate, good natured, versatile and kind. They can however be easily led, dreamy and impractical.